Terry scuffs. Our various breads cost between $3 and $4 a loaf. Alice in Wonderland, The Wind in the Willows, Little Women and other Louisa May Alcott books, Nancy Drew. The Anne of Green Gables series. And do comic books count? Because I was horribly addicted to them. Gazing in desperation at a computer screen for as long as I can stand it. Some days are less desperate than others. Some days I have to review a copy edit or page proofs instead. Some days are devoted to research. There’s no system. I just try to work things out so that the book is finished more or less on time. I read a lot of different authors. Just finished a Jennifer Crusie. Before that, Anne Perry. I’m a big mystery fan and recently became addicted to Victoria Thompson’s Gaslight series and Ashley Gardner’s Regency era series. Last fall I discovered Margaret Maron. I’m also partial to Laurie R. King, Lindsey Davis, Caroline Graham, Ngaio Marsh, and Janet Evanovich, among other mystery writers I always enjoy. I love Terry Pratchett. I’m still working on Patrick O’Brian’s Aubrey/Maturin series. And George MacDonald Frasier’s Flashman books. The Rumpole series by John Mortimer. And since I love research, there are usually history or other non-fiction books in the TBR pile. Most of my friends are romance writers. Those of us who work in the Regency era tend to gravitate to one another. You’ll see us in clumps at conferences. I started wanting to write books about age six or seven–about when I started reading them. I don’t know what the inspiration was. I loved stories, and that’s when I first remember making up stories with a beginning, middle, and end. By age 8 I had written a play. It was a terrible play, rather in the style of the picaresque novel, with forty or fifty acts and nothing holding them together but the heroine–but hey, I was 8. Charles Dickens. I would ask to borrow his brain for a few years or decades. Everything’s changed since I first started writing my novels. Shoe styles, for instance. And didn’t there used to be a lot more publishers and distributors? There were more than half a dozen publishers to whom I could send my first manuscript–a traditional Regency. There were more romance lines overall, which gave writers more choices and opportunities. It seems much harder these days to get published and stay published. But the whole business world has changed. The same thing that’s happened in publishing has happened in other areas–advertising, for instance. So the world changes. That’s life. You adjust. I knew this was a risky profession when I got into it, and I’m happy to be still working. It’s hard for new writers to make it whatever they do. But no one can make it without writing a book people want to read. I think that’s where every writer, new and experienced, needs to focus 99% of his/her energy. Publishers are the most effective, when they invest substantial resources (i.e., money) in promoting a book. They have much more clout and much more money than Average Author, whose efforts, by comparison, have a negligible impact on sales. I think our time’s better invested in writing, which is something we can control. Writing fiction is a risk, no matter what the genre. If you’re not a risk-taker, being an author might not be your best choice of career path. This is not, for the majority, either a stable or lucrative profession. But it’s my profession and in many ways it’s who I am. If I couldn’t get published in historical romance, I would write something else. While I can get published, I plan to work hard and enjoy living in the early 19th century England of my imagination. The one I just finished–because it’s finished.. And really, I do love it. I can’t write a book I don’t love. Then I fall in love with the next book. I can go back and read them…to a point. As the years pass, my interest wanes. Over time, I change; my writing changes. It’s hard to relate to books I wrote ten years ago. It’s hard to relate to the clothes I wore ten years ago. How do you feel when inevitable comparisons are made between Lord Of Scoundrels and your later works? Would you prefer your other books to be judged on their own merit? I get all cranky when someone compares Book A to Book B–whether the comparison book is mine or someone else’s. It’s the artist attitude or a maternal attitude, or maybe it’s both. I feel protective of this thing–this world and its people–that I’ve created out of nothing. What mother wants to hear one of her kids described as inferior to another? That’s the emotional reaction, the artist’s reaction. The reality is, everyone compares. So getting cranky and wanting each book to be judged on its own merits is perhaps unreasonable. After all, people compare Jane Austen’s books. Charles Dickens’s books. They compare works by Shakespeare. And then, for me, Lord Of Scoundrels is a special case. I have trouble getting seriously upset about the comparisons, because I’m too aware that readers are still discussing a book that came out more than ten years ago. For me that’s a taste of immortality. Those “inevitable comparisons” tell me that people have found the book memorable. It’s struck a chord. It was something special. It seems slightly insane to get cranky about that. No. I can barely influence my writing. It comes out the way it comes out. You may not be surprised to learn that the majority of efforts to influence me are along the lines of “Write faster.” How I wish that one worked. I couldn’t see any reason to make a rule about what is or isn’t romance. We’ve done fine all these years without a formal definition. Besides, creative people mostly don’t like rules and will break them anyway. Where we always go: England. We spent a week in London and a week touring Derbyshire. I always want to stay longer, never go often enough. It was way too long ago: six years. Elizabeth Bennett and Mr. Darcy. The kind who are wittier and much more articulate than I am. But I want everyone to read my book. I hear from so many different readers with so many different points of view, and it is amazing the insights they have. I can’t bear to choose just one kind of reader. And you can’t expect me to. I’m a Gemini. I have no idea. In the Regency era stories, the two big names are Jane Austen and Georgette Heyer. As to the romance genre as a whole, I’m neither widely nor deeply read enough to say who the major influence is/was. I’m familiar with any number of authors who innovate, inspire, raise the standards, who make me think, “I wish I’d written that.” But their name is Legion. Of contemporary films: Before Sunrise, Before Sunset, Under the Sun, Bread and Tulips, Monsoon Wedding. There’s also a long list of movies from the 1930s and 1940s with Cary Grant, Katherine Hepburn, Bette Davis, Humphrey Bogart, etc. Jennifer Crusie’s WELCOME TO TEMPTATION. I’ve actually read her more recent ones, but my TBR pile is not only a mile high but out of order. Heheheh, I so know the feeling. Not over a book. I cringe over mistakes in the books. Historical errors make me wild–but for an American writer especially, Regency era England is a minefield, and there’s always something to trip over. Infelicities of phrasing trouble me. Some terrible copy edits–which I fought in vain–make me grind my teeth. But the books as a whole don’t worry me. Though I like to believe my work’s evolved and improved over the years, I’m also sure that each book was the very best I could do at the time. There isn’t one I’m sorry I wrote or feel ashamed of. I just enjoy writing. Or just have to do it whether I enjoy it or not. Then there’s the not having to get up and dressed for work part, which is terrific. And living in my own special private world in my head. My standard answer is practice. Write a lot. I always recommend taking college courses that demand lots of writing (not necessarily creative writing courses, which I scrupulously avoided) and/or getting a job that involves lots of writing. In these situations, you have to write more or less intelligibly whether or not you feel like it, and you have to meet deadlines. This is great training for writers of genre fiction. The third book in my Carsington brothers series, Lord Perfect, is out in March 2006. The hero lives strictly by the rules; the heroine is completely beyond the pale. The back cover copy posted on my website offers a vaguely coherent summary of the story. Thank you for inviting me. It was fun. Coming up next week, it’ll either be Catherine Anderson, or Sharon Sala, but for now, that’s all folks! The Lion’s Daughter is one of the last few books I have read and I loved it. I am very happy to see the reissue. Oh my gosh, I heart Loretta Chase, Lord of Scoundrels was just amazing! 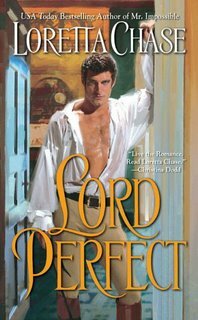 Thanks for interviewing Ms. Chase who wrote my favorite romance of all time, Lord of Scoundrels. By the way your blog is hilarious! BTW, welcome to my blog!! Hope you pop in again!